1. Apply for a visa not more than 3 months from the intended date of stay in South Korea. 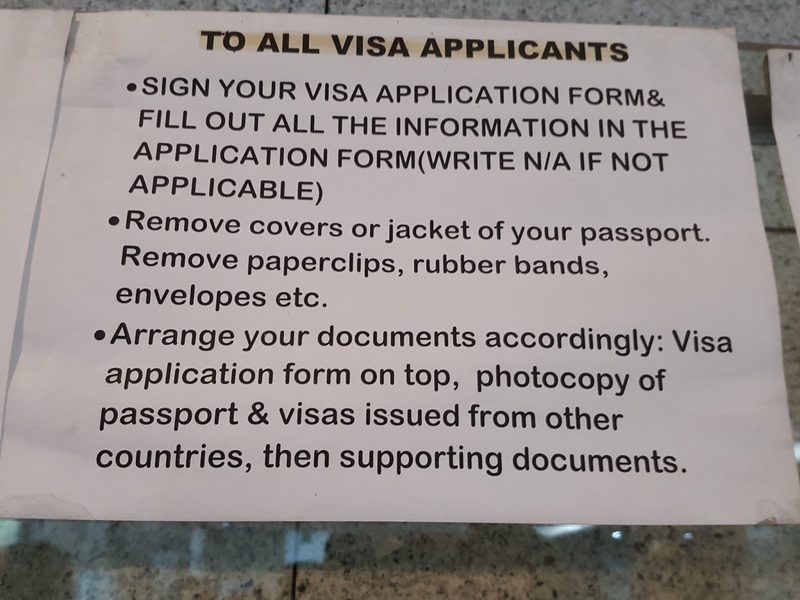 The consul is limited to issuing an expiry date 3 months from the date of visa issuance to applicants, even if you stated in the application form that your intended date of arrival is more than 3 months from the date of application. 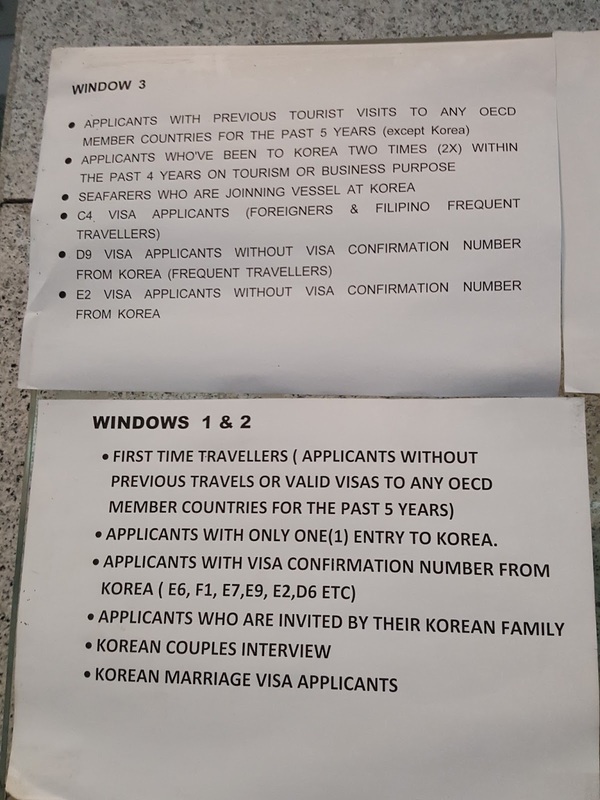 For example, if you plan to stay in Korea until June 1, do not apply for a visa earlier than March 1. 2. Find out if the embassy is open on the date you want to apply. You don't need to get an appointment to apply for a visa to South Korea. You just walk-in. They do not inform you online whether or not the embassy is closed on a Philippine or Korean holiday. 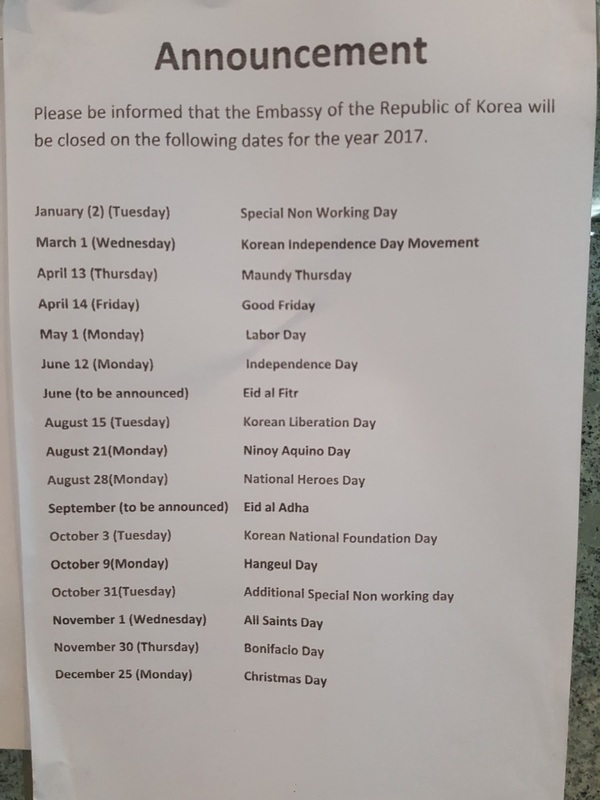 Below is the list of holidays they observe, both Philippine and Korean holidays. The list pertains to 2017 holidays. Adjust the dates accordingly for the subsequent years. NOTE: They only observe national holidays. 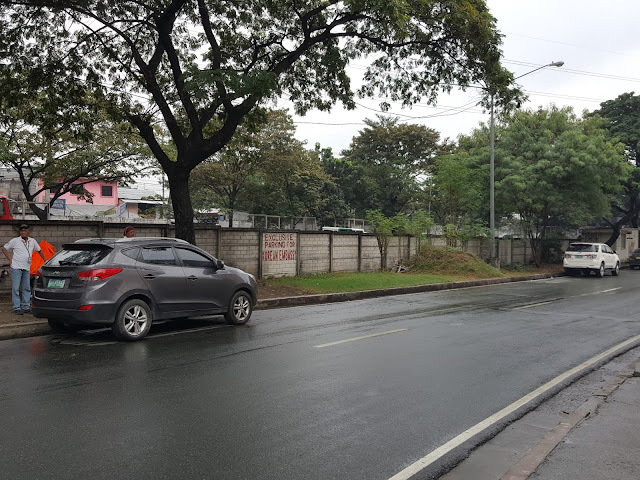 They do not observe municipal holidays like Taguig day, even if the embassy is located in Taguig. 3. Find out if you are eligible for a multiple entry 3-5 year visa. If you have a BDO and BPI credit card, you may be eligible to apply for a multiple entry 3-5 year visa. 4. If you have a visa for any of the OECD countries, you qualify for the express lane at Window 3. This means, you can get your passport (hopefully with visa) after three working days from submission of application. If you submitted your application on January 22 (a Monday), you can get your passport on January 25 (a Thursday). 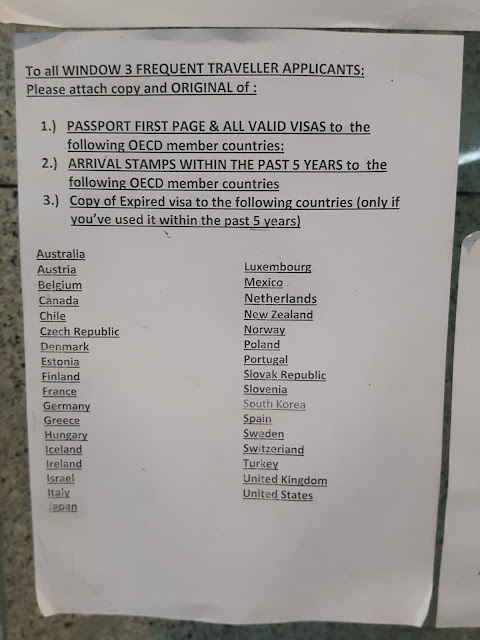 You can present the visa of any OECD country for this purpose, even if EXPIRED, provided you used the visa at least once within the past 5 years. 5. Submit only photocopies of important documents. The embassy DOES NOT RETURN any document except your passport. 6. Arrange your documents in the following order for fast processing. 7. Make sure to check that the embassy personnel assigned to verify your documents and issue the queue number assigned you in the right window. I have seen the embassy personnel assign an applicant to window 1 when she qualified for window 3. Fortunately, the woman noticed the mistake and corrected him. Window 3 is the fast lane. 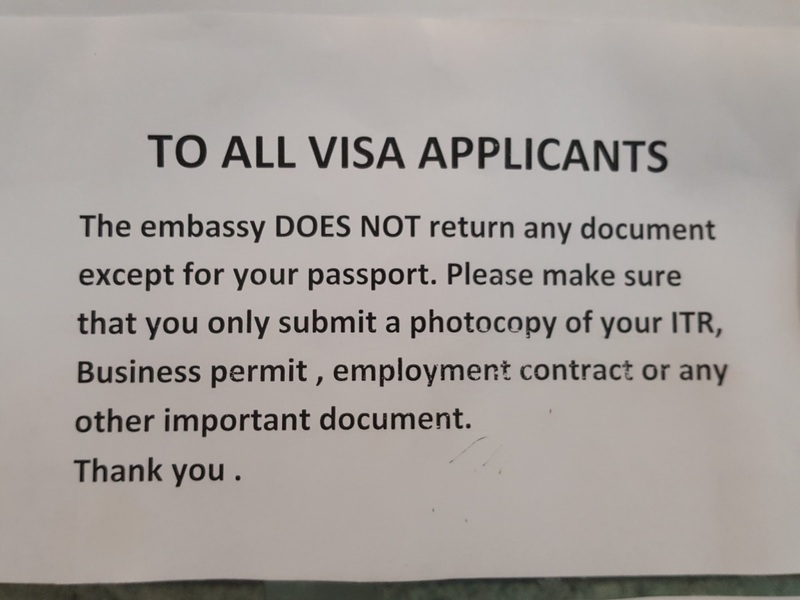 The embassy returns your passport within 3 working days. Windows 1 and 2 are the regular lane. They return your passport within 5 working days. It is a roadside parking on the left side of the McKinley Hill sign. 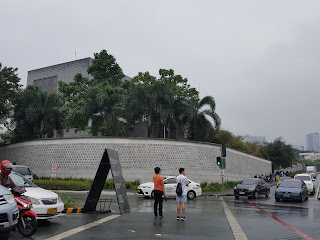 This roadside parking is made an exclusive parking area of the Korean Embassy. 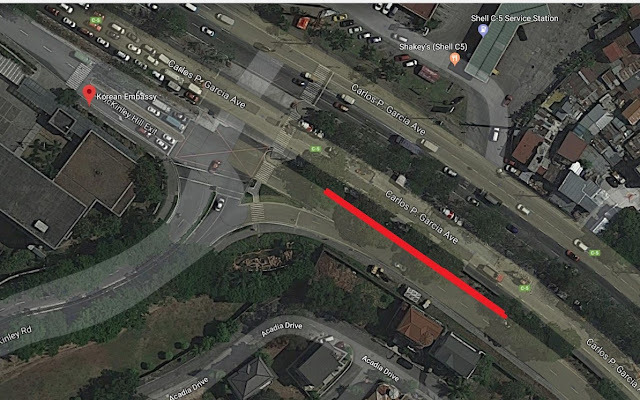 The red line is the location of the parking area.